In my Happiness book, I shared that I’m not necessarily a big believer in marriage anymore, and even dared announcing that sentence might become a topic for a future book. Be careful what you wish for: that dream became a reality when my “Love 2.0” hit the shelves in 2018. This new book is not about travel souvenirs. It’s about my greatest nemesis: love. ‘Love 2.0’ has to do with finding harmony and bringing it into concert with your life. In this article I’ll share one of the most important reasons that compelled me to write this book. It’s not a pretty story. For many years I did everything I could to forget the past: expensive therapy, a library of self-help books, meditation, and even medication. I was actively resisting all the painful experiences from my past. The more I put my past behind me, the less effect it would have on me, I reasoned. But the more energy I directed towards my problems and pain, the more “stress” and “dis-ease” I continued to create in my life. There have been days I wish I didn’t wake up in the morning. After recovering from a painful divorce, I was looking for a transition. I wanted to attract a new relationship into my life. Instead I focused all my energy on holding on to my pain from the past. Life flows, but it doesn’t always flow the way you want it to. I had to not only accept my reality, but deal with it, live it, and live with it. I couldn’t blame anyone else for those circumstances. In rethinking and reframing my memories, I wanted to share my story as if the past didn’t exist. I wanted to write this book of love without referring to the past, without admitting to my flaws and failures. But it doesn’t work that way. Life repeats itself. You have to change your response to get a different outcome. As long as I continued to hold on to painful memories and limiting thoughts and beliefs, I continued to create separation. In the end I had to foot that bill myself. I didn’t just create separation in my relationships, but essentially from my true self. I separated myself from love. I had to let go of the emotional pain of a break-up, past failures and the need for external approval. Thoughts like, “I’m not attractive” or “I will never have a loving relationship” didn’t help. I had to consciously let go of those limiting beliefs. If you are your unique self, you will mature, grow and develop as a human being. You’ll always be on an adventure, enjoying life. Some even say being authentic makes you younger. If you are mediocre and not living your truth you will feel unfulfilled and unhappy. I learned to live for the moment, and take things one day at a time. A day at a time was all that my depressed mindset could handle anyway. Embracing the moment became the cornerstone to escape my depressing reality and build an unlikely future. I committed to a year of transition, symbolized by planting a new tree in my backyard. Its growing roots became a visualization of me becoming more grounded every day as a person. I wasn’t going to be the person I was expected to be anymore. I committed to have a good day, today, regardless of what my own plans for that day might have been. This is my life and I’m going for it. 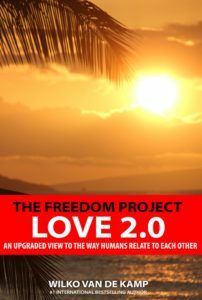 This post contains an excerpt from The Freedom Project Love 2.0: An Upgraded View To The Way Humans Relate To Each Other. It’s available on Amazon and pretty much anywhere else you buy books. The Freedom Project philosophy is to live free through travel, work, and love. Ultimate freedom means designing a lifestyle of wealth, health and abundance, without having to make concessions. This book is for those who don’t want a regular life, but dare to choose excitement, joy and abundance. Love is about creating new ways to take your relationships in all areas of life to the next level. Love, the ultimate journey through life, will help you discover all that – and more.